We are now open for bookings for our plaster casting workshops. This is a unique experience in which participants learns to mix and pour plaster into a mould. 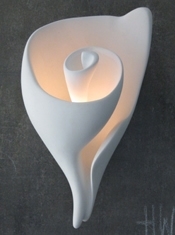 You will create a small plaster cast of one of Hannah's iconic wall sconces - Shell, Tulip or Ovoid. After only half an hour the plaster hardens enough for us to de-mould and hand finish our pieces, before taking them home wrapped delicately in acid-free tissue. 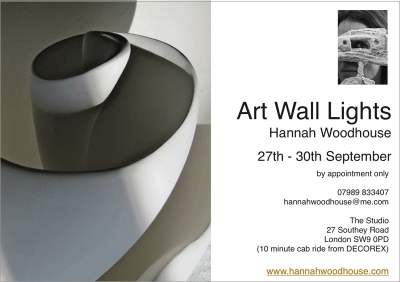 Hannah will explain a little about the history and use of plaster in sculptural and interior applications, and she will also show you her collection of hand made sculptural lighting, in the studio. Tea, coffee and snacks are included and each workshop lasts approx. 2 - 2.5 hours. 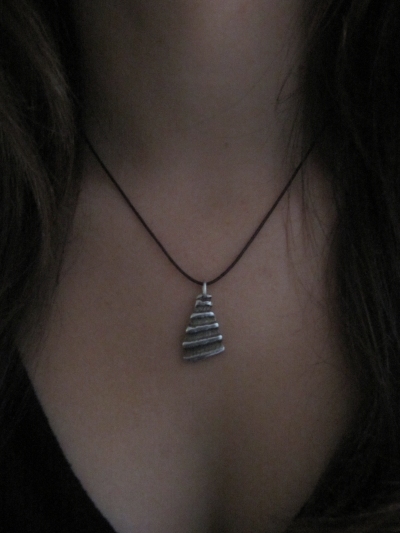 Silver HAPPYnecklace by Hannah Woodhouse, the perfect way to say Happy Birthday or Christmas to your loved ones. I started making simple jewellery pieces a couple of years ago as Christmas presents for my nephews and nieces and god-children....and it seems to have grown from there. I enjoy the challenge of working on a small scale (a change from big bronze lamps). The jewellery still has my stamp - simple, archaic, patinated to look old. 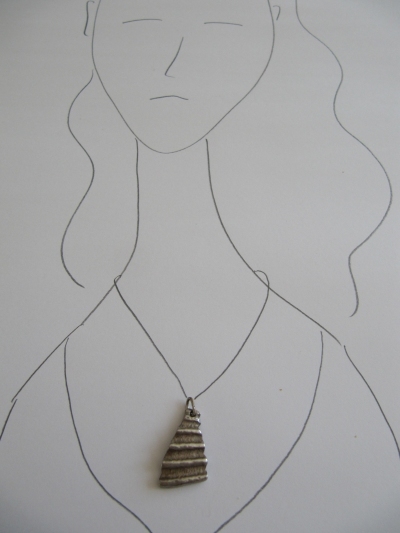 I made up the word blong to describe what I like in jewellery terms - dark, oxydised silver, bronze, matt patinas. Silver HAPPY! comes wrapped in tissue in a black velours pouch, ready to give to your loved one. Price £ 55 including p & p in Europe. My jewellery is definitely blong! as opposed to bling! Launch of the Shanghai Wall Light! 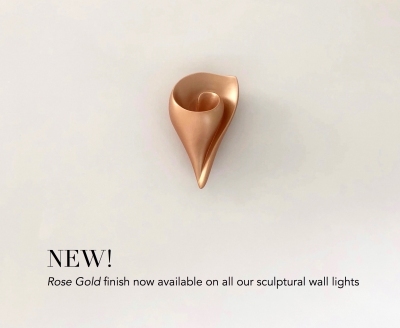 A new twist on an original design by John Cullen, Hannah has worked with John Cullen's design team to develop "the ultimate simple wall light". Made in Hannah's trademark eucalyptus bark paper, this wall light combines clean archtiectural lines with a warm, candle-like quality of light. Next to Hannah's studio in SW France is a 13th C Priory, in a serious state of dilapidation. The owner kindly let us have access to the Priory to take these photographs. 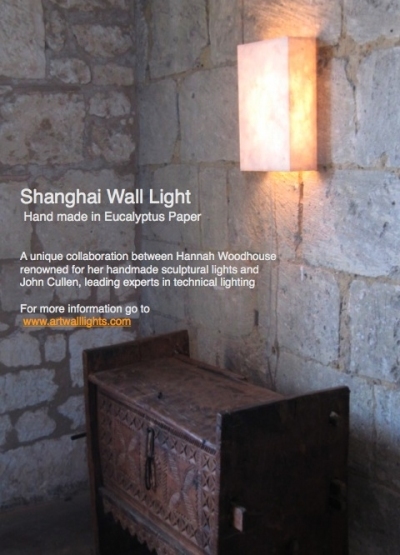 A unique collaboration between Hannah Woodhouse, renowned for her handmade sculptural lights and John Cullen, world leaders in technical lighting, sees the launch of two new products Eucalyptus Paper Shanghai and Hand Etched Steel Shanghai. These two new wall lights follow John Cullen's discreet lighting philosophy but with a new twist. They now have a hand made, artistic element with Hannah's skilful introduction of both the hand made eucalyptus bark paper and hand etched steel. 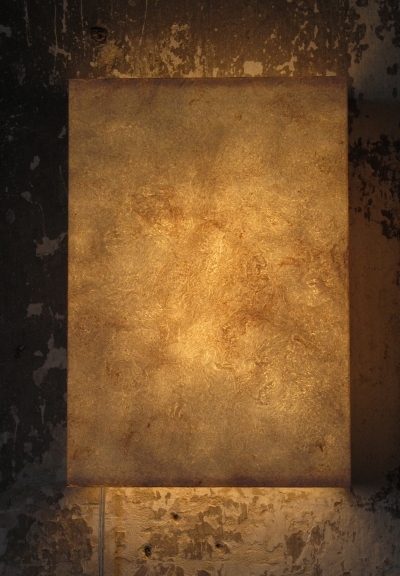 Hand etched steel Shanghai Wall Light is an architectural wall light with a beautifully hand finished patina. Available in two finishes - speckled french grey and dark bronze rust. This shows a close-up detail of the Shanghai Hand Etched Steel Wall Light (speckled french grey) Each piece is hand etched, coloured and polished by Hannah. These cast iron "heart" paperweights are hand etched and patinated by Hannah. Designed as paperweights for those who attack their paperwork with a "heavy heart". Just another example of how steel can be beautifully changed by the process of patination. All of our Wall Lights are hand made and individually hand finished to each client's specifications. We like to work with your colour scheme so that the lights you put in your home really work, not only as lights, but with everything around them. Art Wall Lights is a new concept in lighting. Beautiful hand made wall lights. 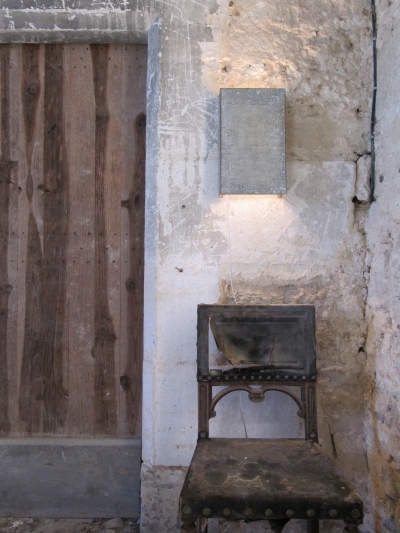 Architectural wall lights and sculptural wall lights made by Hannah Woodhouse. 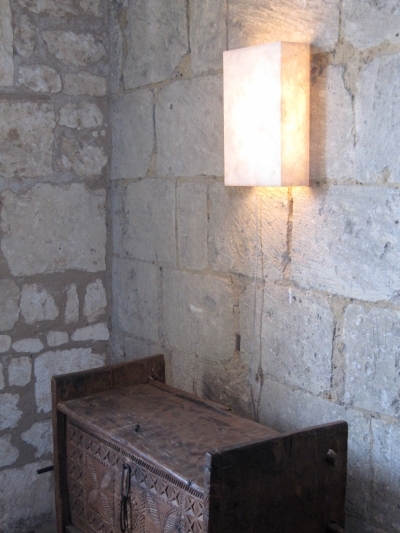 Please contact us if you would like more information about our architectural or sculptural wall lights. At the end of September we opened up our studio as a part of the regional Open Studio season. We had lots of visitors from far and wide. One of our prettiest visitors! 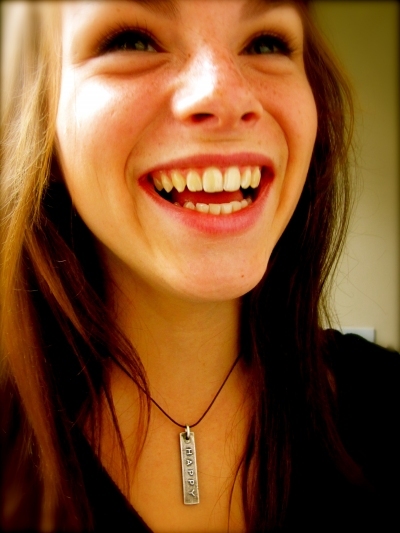 My son's ex girlfriend Camille, who remains a close friend of the family. 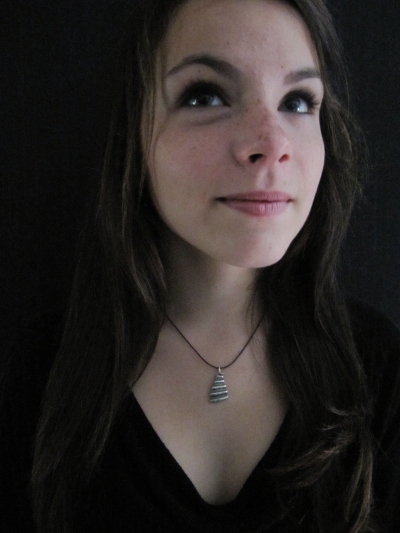 Camille came and helpe me to receive visitors on her day off from university in La Rochelle. I decided to show some of my silver and bronze jewely as well as lights. We had a lovely visit from Blott Kerr-Wilson and her husband Benjamin. Blott is an amazing artist who uses shells (mussels, oysters and many others) to produce extraordinary works of art. Google her! Oh my goodness, it is looking like a jewelry shop! The Shanghai Wall Lights were in evidence, as well as the jewelryon bronze busts! Colours are muted, earthy and elegant. For the patinas & aged finishes I am inspired by lichen, old stone walls, rusty metal tools and other interesting objects found at the local brocantes here in France. I love all things rusty. This wall in our courtyard is the perfect example of a "natural patina". I find most of my inspiration in nature. Willy and I are enjoying the "brocante" season. 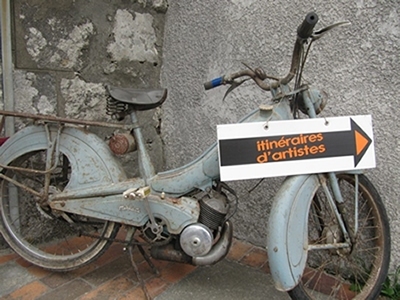 In Spring every village holds it's own brocante or "vide grenier" when the locals empty their attics and sell off their antique linen, family heirlooms, old tools and furniture. Tressle tables piled high line the village square or meander along a river bank. We lose ourselves for hours picking through piles of rusty metal, leather, trinkets and linen. Beats a Saturday afternoon in Ikea! Last week-end we paid 2 euros for this old pressure gage. I'm thinking of making a mould of it, pouring it in bronze and using it as the head and torso for a sculpture - Wife of Oyster Bed Man. The children keep asking us to take them to the beach, and we invariably reply "Oh just one more brocante..."
Here's another bit of great natural "patination" - these zebras with their amazing markings. I took the photo Mattie's birthday trip to the zoo at La Palmyre. I spent the day taking close-ups of animal skins whilst she fed pop corn to the giraffes. Last October we had a wonderful evening “vernissage”, as part of the Charente Maritime open studio season. It was an idyllic, balmy summer's evening, with wine and visitors flowing in equal measure into the courtyard of the 12th Century abbey behind the studio. I was showing some simple pieces, as an introduction of my work in the village. Everyone had a great evening, with people finally able to see inside my studio and find out exactly what I do. This year we will do the open studio event on Friday 30 September and Saturday 1 October 2011. We will have an evening "do" again, but not sure yet if the Friday or Saturday night, times will be confirmed nearer the time. L'Atelier, 3 Rue Maréchal Leclerc, 17250 Pont l'Abbé d'Arnoult, France - for anyone who might like to visit.